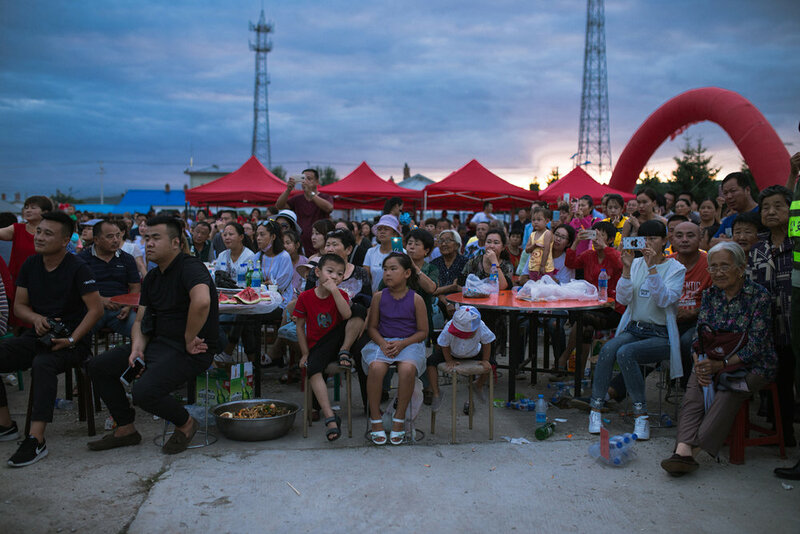 A crowd gathers to watch the annual Fire Festival in Xin'e, Heilongjiang Province. 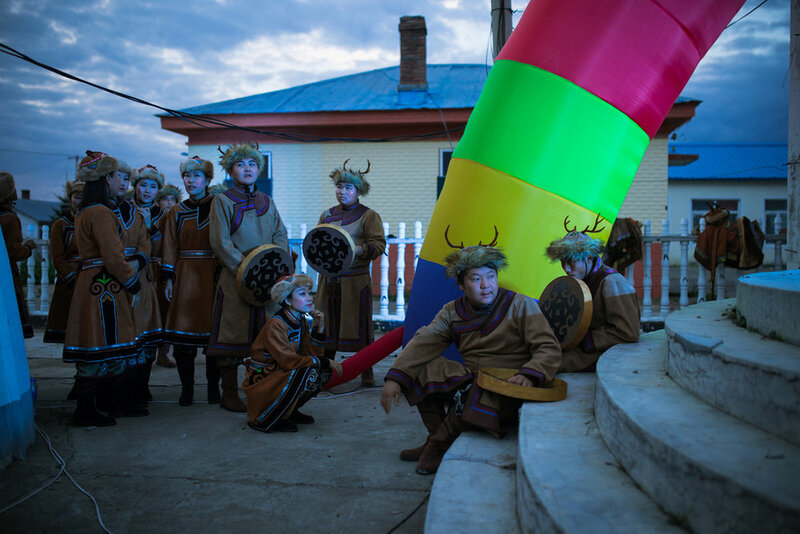 Performers plucked from the local youth wait to perform at the annual Fire Festival. Whilst Xin'e is designated an Oroqen settlement, the ethnic diversity of the region is reflected in the backgrounds of the performers, many of whom are Oroqen, Ewenki or Mongolian or have one parent from the Han majority population following increasing levels of intermarriage throughout the 20th and 21st centuries. "Sometimes I speak Oroqen with my son and my daughter. They understand, but can't speak it. They forgot the language, they go to school for knowledge." 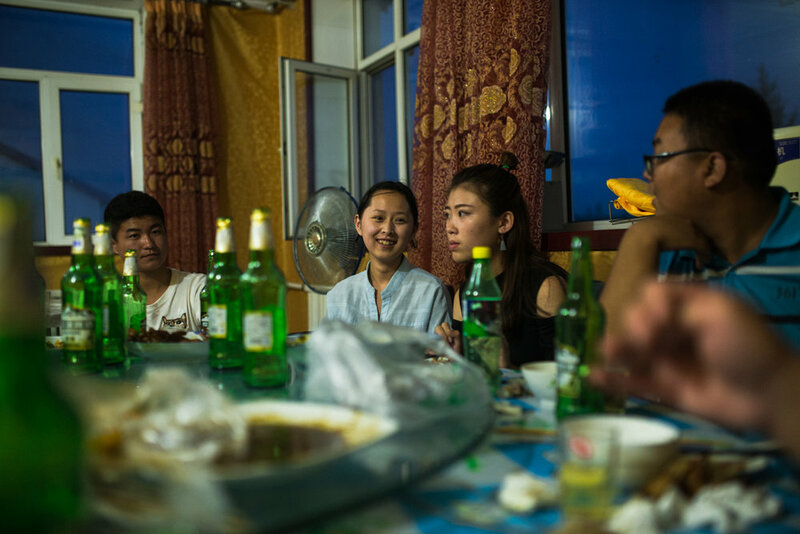 Oroqen youth and their friends from other ethnic groups – Mongolian, Han, Daur and Ewenki, eat together during a summer break. 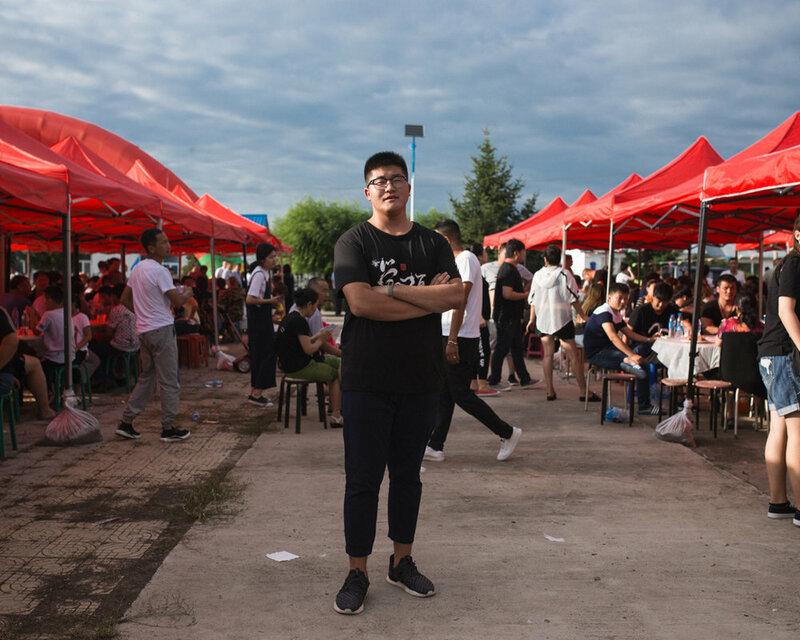 Life for these young people is dramatically different to that of the generations preceding them and many now attend universities across China or follow their parent into roles within local government. 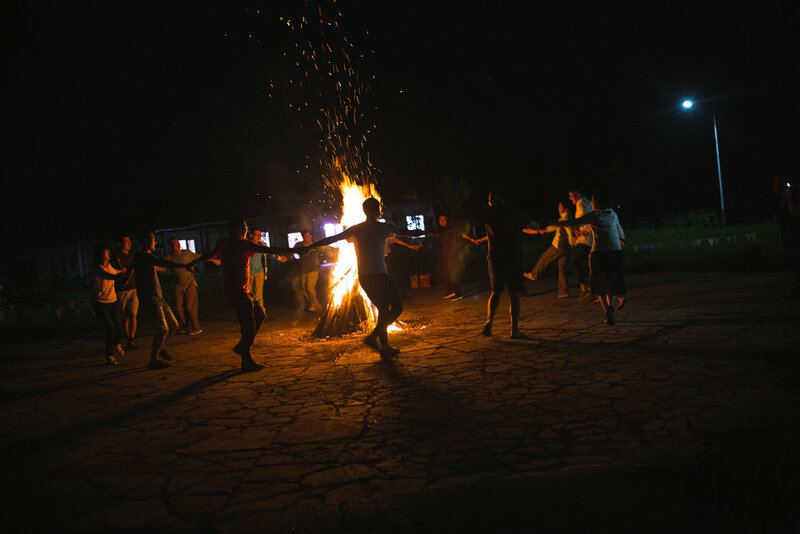 Visiting university professors from Harbin take part in a fire ritual put on as a show by local Oroqen entrepreneurs. Interest in an ethnographically focused tourism industry and folk rituals are growing across contemporary China. 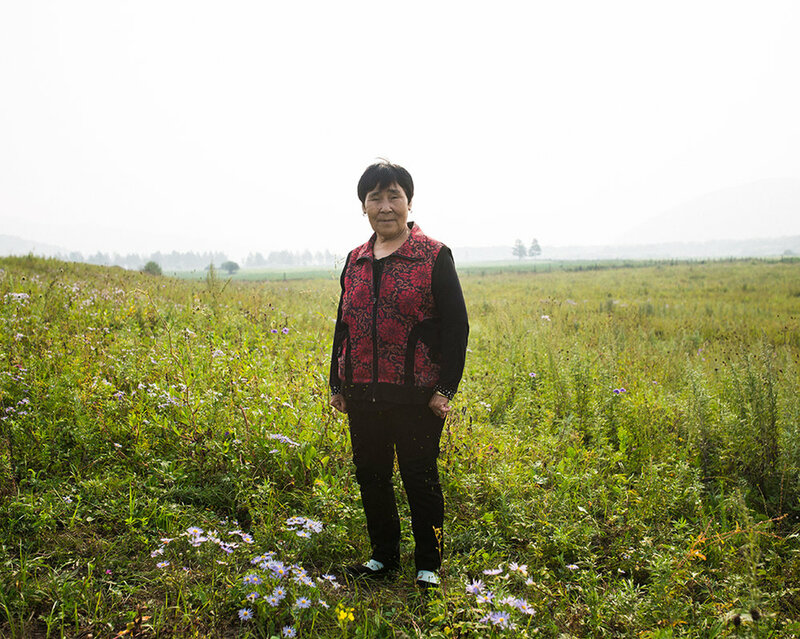 “The Chinese like to 'make' culture, a kind of culture that is created instead of inherited." 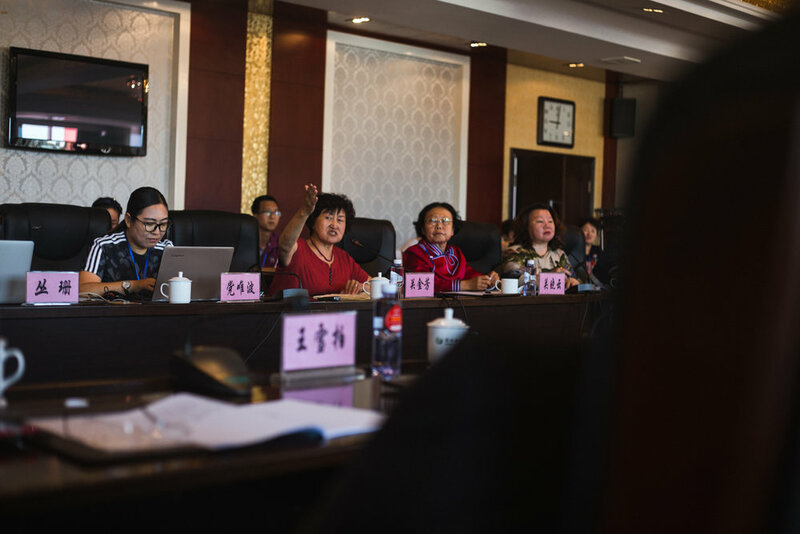 At Oroqen schools, the curriculum attempts to counter a dwindling of the ethnic minority's language, working lessons in Oroqen into their students' weekly schedule. Online platforms are being developed to engage younger learners, however the language remains under threat of extinction. Oroqen children are a minority at the school, with only two of the children pictured having Oroqen lineage. 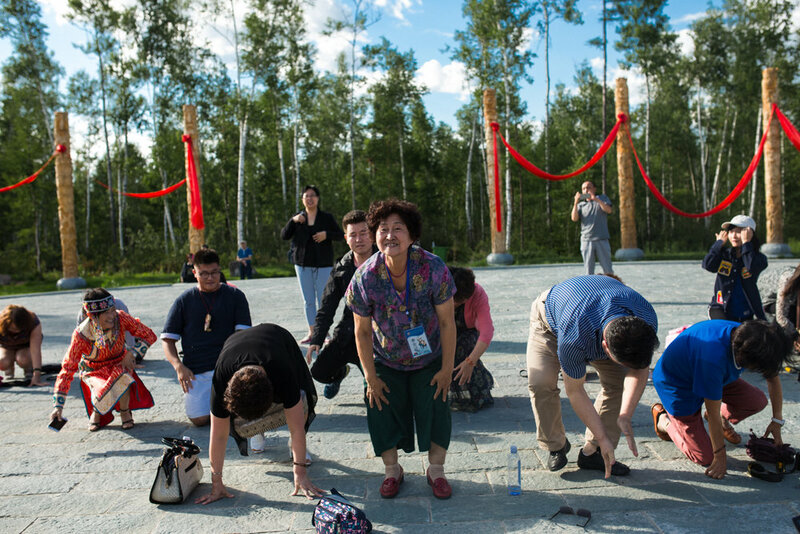 Community leader Guan Jinfang leads visiting government representatives in a ritual praying for fortune from a newly constructed monument to shamanism. The Oroqen are one of oldest ethnic minorities in Northeast China and have cultural and linguistic links to numerous ethnic minority groups spread across Heilongjiang, Inner Mongolia and out to Siberia across the Russian border. As an anthropologist Guang Peng works to document the language and culture of his community in a rapidly changing world. Guan Jinfang appeals to government representatives for funding and resources to carry out educational projects in the region. At this conference an online platform for Oroqen language learning was unveiled. 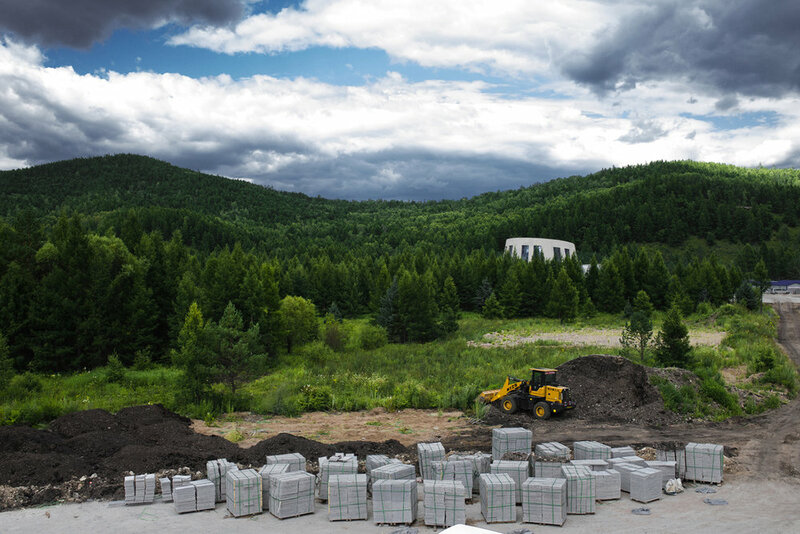 Widespread investment has poured into the Inner Mongolian tourist industry in recent years, and folk culture has become a target for a burgeoning eco-tourism industry. The Ewenki are an ethnic minority with close links to the Oroqen who number around 30,000 within China, with greater number spreading out to the Siberian Taiga. A minority of the Ewenki maintain historic cultural links with reindeer herding, having chosen to remain in the forests whilst many have been settled by the state. "When I first slept in a house I awoke one night and thought I had died. When we were in the djiu I would be able to look up at the stars but under the roof all I could see was darkness." Young Oroqen depart after lunch on a restaurant on the river. The Heilongjiang (or Amur in Russian) acts as the border between China and Siberia and historically Oroqen and many other ethnic groups moved between the two regions. "The definition of a language disappearing is not that no-one speaks it anymore, but rather the loss of people who speak it from childhood. When the last native speaker dies, the language goes with them." Alihe Oroqen museum was rebuilt in recent years and contains an extensive and detailed physical record of Oroqen life. Attendance remains low however and the results of investment wait to be seen.